Hugo Rodallega's second-half strike earned Wigan their first points of the season after a resilient performance away to lacklustre Tottenham. Rodallega smashed in a fine cross-shot as the Latics shrugged off two heavy home drubbings to record their first victory at White Hart Lane. Steve Gohouri also hit the bar for the visitors with a volley while Antolin Alcaraz missed a glorious chance. Spurs offered little but Jermain Defoe twice went close in the first half. First the England forward collected Benoit Assou-Ekotto's pass and spun brilliantly in the box only to see his well-struck shot superbly saved by Ali Al Habsi. And Defoe then turned sharply on the edge of the area and showed pace and power to get away from two defenders before flicking a shot just wide with the outside of his right boot. But in truth Spurs were well below par and Wigan thoroughly deserved their win for a tenacious display in which they showed commendable character. On their last visit to Tottenham in November 2009, the Latics suffered a 9-1 hammering with Defoe scoring five. And Wigan's confidence can hardly have been helped after their 8-0 mauling at Chelsea on the final day of the 2009-10 season was followed up by 4-0 and 6-0 defeats at the DW Stadium in their opening two matches of the 2010-11 campaign. But Wigan started much the brighter and could easily have taken advantage in the opening stages of a Spurs side looking like their midweek Champions League exploits had caught up with them. The north Londoners lacked bite and sharpness in the opening 20 minutes and nearly found themselves trailing but Gohouri's belting six-yard volley crashed off the bar and to safety from Alcaraz's fine nod back. Dream-like defending from Assou-Ekotto - which twice saw the left-back caught in possession in the opening 15 minutes - could also have easily led to Wigan goals. But the home side suddenly woke up around the mid-way point of the first period and it was Defoe - still in the side despite fears over his ongoing groin injury - who was their main threat, with two typically alert efforts. Neither chance found the back of the net and when Defoe's strike partner, Peter Crouch, was forced off injured at the interval Spurs boss Harry Redknapp took the opportunity to try to liven things up. However Crouch's replacement, Roman Pavlyuchenko, offered little in a dreary 25 minutes after the break which saw the north Londoners continually frustrated by Wigan's organisation. And as frustration among the home fans grew it was the visitors who started to look more likely to break the deadlock. Alcaraz somehow blazed over from six yards for a contender for miss of the season and Gomez volleyed over. Fabulous gritty display by Wigan, who says we don't know how to grind out points? But with Spurs still breathing a collective sigh of relief, Rodallega did find the back of the net for the visitors with a searing shot across keeper Carlo Cudicini. Finally the home side woke from their slumbers and Tom Huddlestone sent a volley just past the post and Defoe saw another fizzing strike also go just wide. In a frantic finish Niko Krancjar and Michael Dawson were both denied by the excellent Al Habsi. But Tottenham could not find an equaliser and slipped to their first home defeat in 18 league and cup games. 95:17 The ref blows the whistle to begin the match. Correction - 90:00+4:39 Roman Pavlyuchenko gives away a free kick for an unfair challenge on Steve Gohouri. Antolin Alcaraz takes the direct free kick. 90:00+4:39 Unfair challenge on Steve Gohouri by Roman Pavlyuchenko results in a free kick. Steve Gohouri takes the free kick. 90:00+4:15 Attacking throw-in by James McArthur (Wigan). 90:00+3:48 Inswinging corner taken from the left by-line by Niko Kranjcar, Steve Gohouri manages to make a clearance. 90:00+3:03 Younes Kaboul has a headed effort at goal from deep inside the area missing to the left of the target. 90:00+2:43 Free kick awarded for a foul by Maynor Figueroa on Dos Santos Giovani. Free kick taken by Niko Kranjcar. 90:00+1:18 Goal kick taken long by Ali Al Habsi (Wigan). 89:13 Hugo Rodallega fouled by Niko Kranjcar, the ref awards a free kick. Jordi Gomez restarts play with the free kick. 88:38 Jordi Gomez decides to take a short corner. Short corner taken by Jordi Gomez. 88:14 Short corner taken by Jordi Gomez. 87:43 Roman Pavlyuchenko handles the ball and concedes a free kick. Indirect free kick taken by Ali Al Habsi. 87:33 Gareth Bale delivers the ball. 86:34 Michael Dawson takes a shot. Save by Ali Al Habsi. Correction - 85:47 Substitution James McArthur joins the action as a substitute, replacing Ronnie Stam. Correction - 85:47 Niko Kranjcar takes a shot. Niko Kranjcar decides to take the corner short, Ali Al Habsi makes a save. Inswinging corner taken from the right by-line by Gareth Bale. 85:47 Save by Ali Al Habsi. 85:47 Substitution James McArthur joins the action as a substitute, replacing Ronnie Stam. 85:47 Niko Kranjcar takes a shot. 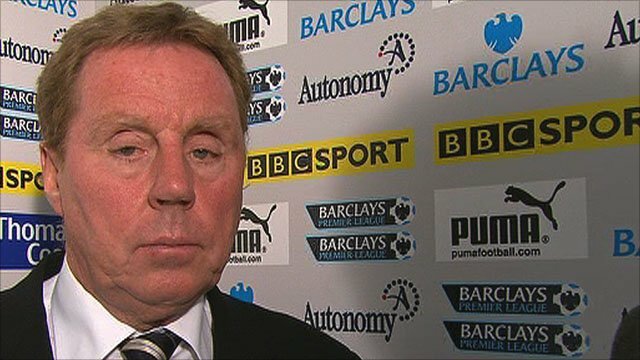 Corner taken short by Niko Kranjcar, save by Ali Al Habsi. Corner from right by-line taken by Gareth Bale. 85:05 The offside flag is raised against Hugo Rodallega. Free kick taken by Gareth Bale. 84:34 Jordi Gomez decides to take the corner short. 83:46 Effort from the edge of the penalty box by Jermain Defoe goes wide of the right-hand upright. 82:10 Corner taken right-footed by Niko Kranjcar to the near post, clearance made by Emmerson Boyce. 81:53 Ledley King fouled by Hugo Rodallega, the ref awards a free kick. Ledley King restarts play with the free kick. 81:15 Effort from the edge of the box by Tom Huddlestone goes wide of the right-hand upright. 79:50 The assist for the goal came from Mohamed Diame. 79:50 GOAL - Hugo Rodallega:Tottenham 0 - 1 Wigan Hugo Rodallega scores a goal from inside the penalty box to the bottom left corner of the goal. Tottenham 0-1 Wigan. 79:18 Centre by Hugo Rodallega, Jordi Gomez produces a left-footed shot from inside the area that clears the crossbar. 78:38 The ball is crossed by Hugo Rodallega, Strike from close range by Antolin Alcaraz clears the bar. 76:48 Strike comes in from Tom Huddlestone from the free kick. 76:48 Booking Maynor Figueroa is booked. 76:41 Niko Kranjcar fouled by Antolin Alcaraz, the ref awards a free kick. 75:59 Defending throw-in by Wilson Palacios (Tottenham). 75:13 Outswinging corner taken by Niko Kranjcar from the right by-line played to the near post, clearance made by Jordi Gomez. 75:01 Gareth Bale decides to take the corner short. 73:36 Hendry Thomas restarts play with the free kick. 73:36 Booking Niko Kranjcar is booked. 73:31 Free kick awarded for a foul by Niko Kranjcar on Hendry Thomas. 72:18 Substitution Dos Santos Giovani on for Aaron Lennon. 72:05 Jordi Gomez has an effort at goal from outside the box which goes wide left of the target. 71:30 Roman Pavlyuchenko is ruled offside. Hendry Thomas takes the free kick. 69:43 Unfair challenge on Jordi Gomez by Wilson Palacios results in a free kick. Maynor Figueroa takes the direct free kick. 69:31 Attacking throw-in by Younes Kaboul (Tottenham). 69:18 Attacking throw-in by Younes Kaboul (Tottenham). 68:55 Attacking throw-in by Gareth Bale (Tottenham). 68:25 The ball is delivered by Ronnie Stam. 68:03 Attacking throw-in by Maynor Figueroa (Wigan). 67:18 Substitution Jordi Gomez joins the action as a substitute, replacing Mauro Boselli. 63:36 Attacking throw-in by Emmerson Boyce (Wigan). 62:32 Corner from the left by-line taken by Niko Kranjcar, clearance by Maynor Figueroa. 61:12 Inswinging corner taken by Gareth Bale, clearance by Steve Gohouri. 59:53 Aaron Lennon crosses the ball, blocked by Maynor Figueroa. 58:44 Free kick awarded for an unfair challenge on Aaron Lennon by Hendry Thomas. Strike on goal comes in from Gareth Bale from the free kick, Hendry Thomas gets a block in. Inswinging corner taken left-footed by Gareth Bale played to the near post, clearance by Mohamed Diame. 58:24 Younes Kaboul takes a shot. Maynor Figueroa gets a block in. 57:21 Hendry Thomas concedes a free kick for a foul on Niko Kranjcar. Niko Kranjcar takes the free kick. 56:51 Aaron Lennon sends in a cross, clearance by Steve Gohouri. 56:13 Attacking throw-in by Maynor Figueroa (Wigan). 55:11 Centre by Aaron Lennon, Steve Gohouri makes a clearance. 54:05 Younes Kaboul sends in a cross. 53:15 Goal kick taken long by Ali Al Habsi (Wigan). 52:40 Gareth Bale crosses the ball, Steve Gohouri manages to make a clearance. 51:26 The ball is sent over by Roman Pavlyuchenko, save made by Ali Al Habsi. 51:20 Defending throw-in by Gareth Bale (Tottenham). 50:14 Aaron Lennon produces a cross, Roman Pavlyuchenko takes a shot. Save made by Ali Al Habsi. 49:59 Maynor Figueroa takes a shot. Carlo Cudicini makes a save. 48:29 Ledley King challenges Mauro Boselli unfairly and gives away a free kick. Hugo Rodallega produces a shot on goal direct from the free kick, blocked by Gareth Bale. 47:45 Short corner taken by Niko Kranjcar. 47:00 Goal kick taken long by Carlo Cudicini (Tottenham). 45:47 Centre by Ronnie Stam, clearance by Wilson Palacios. 45:01 Substitution (Tottenham) makes a substitution, with Roman Pavlyuchenko coming on for Peter Crouch. 45:01 Substitution Benoit Assou-Ekotto leaves the field to be replaced by Niko Kranjcar. 45:00+2:29 Goal kick taken long by Ali Al Habsi (Wigan). 45:00+0:35 Mauro Boselli challenges Ledley King unfairly and gives away a free kick. Tom Huddlestone restarts play with the free kick. 42:26 Free kick taken by Michael Dawson. 42:26 Booking Tom Huddlestone is cautioned. 42:15 Booking Hendry Thomas is shown a yellow card. 42:09 Foul by Hendry Thomas on Aaron Lennon, free kick awarded. 40:16 Foul by Hendry Thomas on Peter Crouch, free kick awarded. Free kick crossed left-footed by Gareth Bale from right wing, clearance made by Emmerson Boyce. 39:11 Jermain Defoe has an effort at goal from just inside the box that misses to the right of the target. 37:53 Hugo Rodallega produces a right-footed shot from just outside the box that misses to the right of the net. 37:14 Attacking throw-in by Maynor Figueroa (Wigan). 36:52 The referee penalises Benoit Assou-Ekotto for handball. Indirect free kick taken by Hendry Thomas. 36:31 Defending throw-in by Maynor Figueroa (Wigan). 35:02 Unfair challenge on Mohamed Diame by Tom Huddlestone results in a free kick. Free kick taken by Hugo Rodallega. 34:26 The ball is sent over by Aaron Lennon, Emmerson Boyce makes a clearance. 34:14 Corner taken short by Gareth Bale. 33:40 Gareth Bale takes a outswinging corner to the near post, Ali Al Habsi manages to make a clearance. 33:35 Younes Kaboul delivers the ball, Steve Gohouri manages to make a clearance. 32:29 Emmerson Boyce challenges Gareth Bale unfairly and gives away a free kick. Free kick crossed by Younes Kaboul, Ali Al Habsi makes a save. 31:34 Gareth Bale produces a cross, save by Ali Al Habsi. 31:18 Attacking throw-in by Gareth Bale (Tottenham). 30:26 Corner taken by Gareth Bale, clearance by Steve Gohouri. 29:01 Hugo Rodallega fires a strike on goal direct from the free kick, Younes Kaboul gets a block in. 29:01 Booking Michael Dawson booked. 28:55 Foul by Michael Dawson on Mohamed Diame, free kick awarded. 28:45 Attacking throw-in by Emmerson Boyce (Wigan). 27:37 The ball is sent over by Benoit Assou-Ekotto. 26:45 Outswinging corner taken left-footed by Gareth Bale, clearance made by Maynor Figueroa. 26:29 Attacking throw-in by Gareth Bale (Tottenham). 25:28 Free kick awarded for a foul by Peter Crouch on Hendry Thomas. Free kick taken by Hendry Thomas. 24:49 Shot from just outside the area by Hugo Rodallega goes over the bar. 24:31 Mauro Boselli takes a shot. Save by Carlo Cudicini. 23:10 Attacking throw-in by Gareth Bale (Tottenham). 22:54 Shot from 12 yards by Jermain Defoe. Ali Al Habsi makes a save. 22:42 Attacking throw-in by Gareth Bale (Tottenham). 19:54 Gareth Bale crosses the ball, save by Ali Al Habsi. 17:28 Tom Huddlestone gives away a free kick for an unfair challenge on James McCarthy. Ali Al Habsi restarts play with the free kick. 17:21 Attacking throw-in by Younes Kaboul (Tottenham). 14:50 Goal kick taken long by Ali Al Habsi (Wigan). 14:17 Outswinging corner taken left-footed by Gareth Bale played to the near post, Emmerson Boyce manages to make a clearance. 14:01 Aaron Lennon delivers the ball, clearance by Steve Gohouri. 13:40 Attacking throw-in by Younes Kaboul (Tottenham). 13:23 Gareth Bale takes a inswinging corner to the near post. 13:04 Gareth Bale takes a shot. Steve Gohouri gets a block in. 12:47 Attacking throw-in by Maynor Figueroa (Wigan). 12:04 Outswinging corner taken by Ronnie Stam. 10:45 Defending throw-in by Younes Kaboul (Tottenham). 9:40 Attacking throw-in by Younes Kaboul (Tottenham). 8:56 Jermain Defoe fouled by Hendry Thomas, the ref awards a free kick. Michael Dawson restarts play with the free kick. 7:52 Goal kick taken long by Carlo Cudicini (Tottenham). 7:04 Mohamed Diame takes a shot. Blocked by Tom Huddlestone. Corner taken by Hugo Rodallega, Steve Gohouri takes the chance to get an effort at goal. 6:14 Goal kick taken long by Carlo Cudicini (Tottenham). 5:39 Defending throw-in by Benoit Assou-Ekotto (Tottenham). 4:07 The assistant referee flags for offside against Jermain Defoe. Ali Al Habsi takes the free kick. 3:28 Attacking throw-in by Maynor Figueroa (Wigan). 3:18 Goal kick taken long by Ali Al Habsi (Wigan). 2:35 Gareth Bale fouled by Emmerson Boyce, the ref awards a free kick. Gareth Bale restarts play with the free kick. 2:05 Attacking throw-in by Emmerson Boyce (Wigan). 1:14 Effort from outside the penalty area by Hugo Rodallega goes wide left of the goal. 0:34 Corner taken right-footed by Hugo Rodallega to the near post, clearance made by Michael Dawson. 0:11 Free kick awarded for an unfair challenge on Hugo Rodallega by Michael Dawson. Direct free kick taken by Maynor Figueroa.